In one of last month’s G.O.T.H. posts, I shared an excerpt from Sleuth, the latest release from Canadian mystery author Gail Bowen. This informative and entertaining guide provides excellent advice for writers of all genres. 1. “Vigorous writing is concise” (William Strunk Jr.). Strunk and White’s The Elements of Style will always be a writer’s best friend. Be concise; be concrete. Cut until you can cut no more. Almost every piece of writing can be improved if you cut it by a third. 2. “Try to leave out the parts people skip” (Elmore Leonard). Deep-six your prologue. The material there is generally back story and can be worked in later. Your first task is to bring your reader into the world of your novel; start the action and write an opening that will keep your reader reading. 3. “Using Adverbs is a mortal sin” (Elmore Leonard). British writer Esther Freud’s advice is even more draconian. Freud instructs writers to cut out all metaphors and similes. I’m with Leonard on adverbs, but when it comes to metaphors and similes I’ve been known to indulge myself. I always feel terrible the next morning, but nobody’s perfect. 4. “Substitute ‘damn’ every time you’re inclined to write ‘very.’ Your editor will delete it and the writing will be just as it should be” (Mark Twain). Amen! 5. Don’t explain too much. Give your readers credit. Allow them to be come part of the creative process. If you’ve done your work as a writer, then your readers will do the rest. 6. Read aloud passages in your novel you suspect might be problematic. If there is a problem, then rereading the passage aloud will reveal it. 7. January 24th is the feast day of Francis de Sales, the patron saint of writers and journalists. I understand he’s available 24/7. 8. Enjoy the ride. Ann Patchett says, “Writing is a job, a talent, but it’s also the place to go in your head. It is the imaginary friend you drink your tea with in the afternoon.” Most people have to say goodbye to their imaginary friends when they start kindergarten; writers get to keep their imaginary friends forever. 9. Ray Bradbury says the most important items in a writer’s make-up are zest and gusto. I agree. If you can’t imagine your life without writing, then you’re a real writer. Stay the course. Source: Sleuth by Gail Bowen, pp. 142-143. The two most dangerous years occur during the first year of life and the year immediately following retirement. Nothing could be truer for Joanne Kilbourn, the familiar protagonist in the latest Gail Bowen mystery. As Joanne retires from her position as political science professor at the University of Regina, she looks forward to spending the summer at her cottage on Lawyer’s Bay and gently easing into her new life. After barely a day of leisure, she and her husband Zack Shreve receive a call informing them that a bomb has exploded in the garage of their Regina home. Forced to move into a renovated loft with her husband and adopted 14-year-old daughter, Joanne faces an unsettled future and has little time to reflect upon retirement. Her new neighborhood is a battle zone for the wealthy developer, Leland Hunter, and a group calling themselves the “Warriors,” who are fighting the gentrification of their community. To complicate things further, Joanne’s older daughter Mieka becomes romantically involved with agitator Riel Delorme and Leland is killed while jogging. 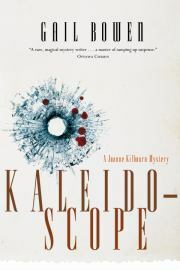 The thirteenth of Gail Bowen’s books, Kaleidoscope is one of the best in the series. Since 1990, I have looked forward to each new addition in the character-driven mystery series. In a recent interview, the septuagenarian assured her readers that she has no immediate plans to write a stand-alone book or terminate the Joanne Kilbourn saga. Looking back at some of my earlier work, I cannot help but cringe at my use of “said bookisms” such as roared, admonished, exclaimed, queried, and hissed. I was trying to avoid overusing the word “said” and looked for suitable alternatives. I realize now that using all those words only made it sound like I enjoyed using my thesaurus. I was annoying the reader and drawing attention away from the dialogue. It is not necessary to help the reader interpret the dialogue, or worse, tell the reader how the words are said instead of showing him. 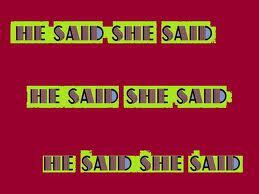 If the dialogue is strong enough, “he said” and “she said” will do. Like other parts of speech—the, is, and, but—that are used several times on each page, “said” is invisible to the reader and allows him to concentrate on the action and dialogue. To add variety, I have been working on using action to vary the tags. I am also trying to simplify the narrative and use taut dialogue to build up tension. The news I was about to deliver was harsh, and Taylor and Zack both knew it. Zack reached across the table and took our daughter’s hand. “So how bad is it?” he asked. “So, what’s left?” Taylor asked, her voice small. “But the room where the pool was is gone?” she asked.